The television images from the Mediterranean are truly horrific but the solution being pressed on European nations by charities cannot be the right answer. They seem to want a return to the Mare Nostrum but at an enhanced level. All this will do is to encourage more and more immigrants to make the journey. We might as well charter a stack of cruise liners, line them up at ports along the southern Mediterranean and ferry boatloads of exiles from the African continent to mainland Europe. What would happen then? I think we all know. European countries could not cope with that level of inward immigration. What then, is the answer? I am no expert but I think there are two stages. In the short term, we need to increase the naval military presence to prevent the traffickers from plying their trade. This has to involve not just ships but marines to board boats with immigrants, arrest the traffickers and return the passengers whence they came. The traffickers need to be locked up for a long time. In the longer term, we need to work out how to eliminate the horrendous pressures that are forcing huge numbers of Africans to risk the Mediterranean rather than stay in the country where they lived and had jobs. For a starter, perhaps we could target our overseas aid spending better? 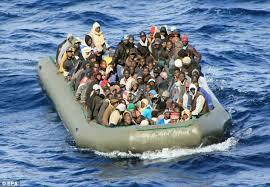 What we can’t do is to open up the whole of Europe to huge numbers of Africans fleeing their own land. Some may have skills we can use; many will not. The UK does not need any more pressures for cheap homes and we can’t afford a burgeoning benefits bill. I may be accused of cruelty in the face of what we have seen and, no doubt, there will be those who say we should not have destroyed Gadaffi but would Libya have been any safer and any better for its citizens if he was still running the show? This entry was posted in Politics and tagged Mare Nostrum, Mediterranean immmigrants. Bookmark the permalink.